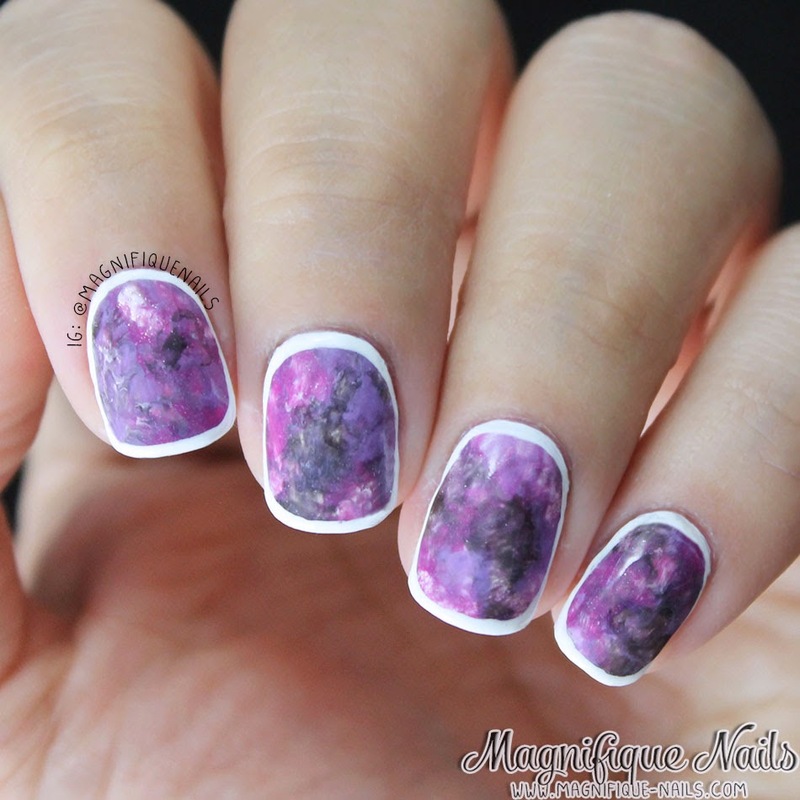 Magically Polished |Nail Art Blog|: Radiant Orchid! Hello lovely readers! 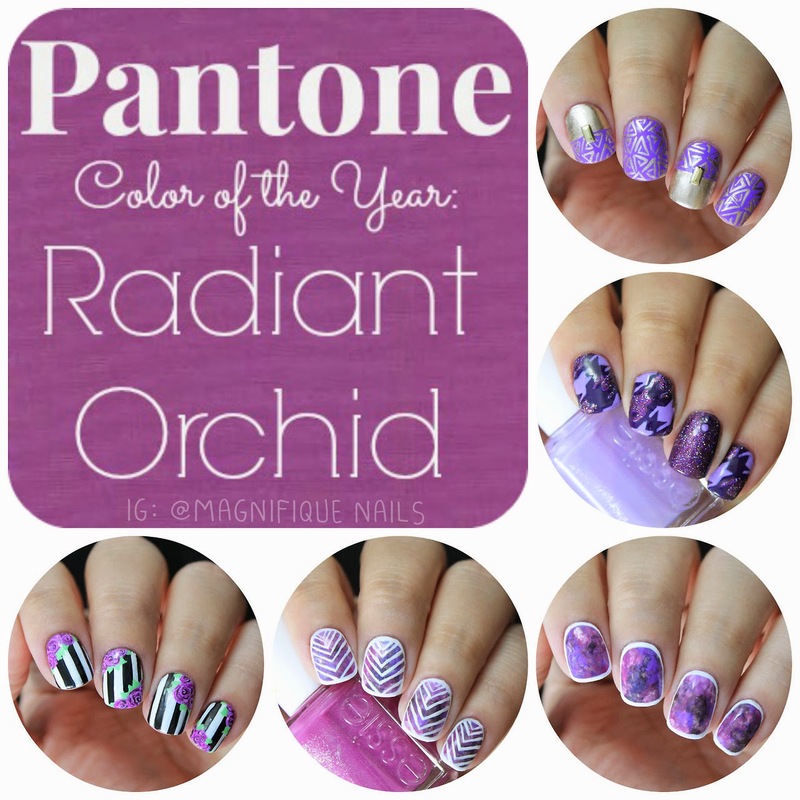 For today's blog post I wanted to start off by doing a collage of nail art ideas for 2014 Pantone's Color of the Year: Radiant Orchid Mani's. Which is a lovely purple shade with pink undertones. At first I wanted to do a simple orchid flower, but I've opted to do something else. Golden Geometric Triangles: I loved doing this design. It's pretty much a through back from the blue and white I did last year (here). The base is two coats of Revlon Enchanting. 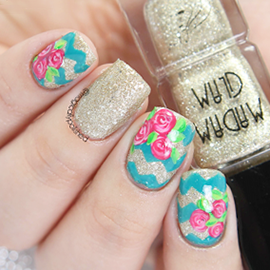 With a nail art brush I drew the triangles using Essie's Good as Gold. And with the nail polish brush I applied it above the design and accented it with a stud in the middle. 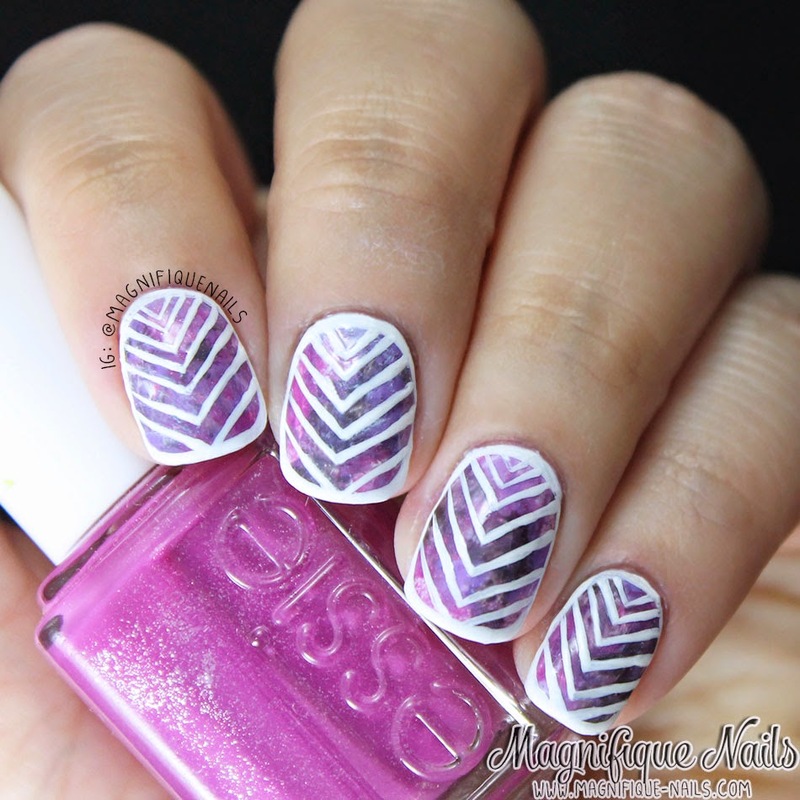 Purple Houndstooth and Glitter Nails: This mani is definitely a purple explosion. I can honestly say I went aalllittle overboard, but I kinda like it. I wanted to do a glitter and a lighter colored houndstooth. The base is two coats of Revlon Moon Candy Eclipse and the houndstooth is Essie Full Steam Ahead with Color Club Gift Of Sparkle. Using the same Color Club I applied two coats and studs to match. Outlined Purple Watercolor Nails: These nails of-course were inspired by one my favorite nail bloggers out there Spektor's Nails. She created this really cute outlined watercolor nails tutorial and I wanted to try it out. I applied two coats of OPI Alpine Snow and then following the tutorial I added Essie Full Steam Ahead and The Girls Are Out. Using a long stripping brush, I outlined around the nails with OPI Alpine Snow. Knowing myself, I just couldn't help to add some lines on my outlined watercolored nails. I really have no idea on what to call this (need help!! ), but I really thought it looked cool. I actually like it better with this than alone. Using a stripping brush I added the lines, with OPI Alpine Snow. 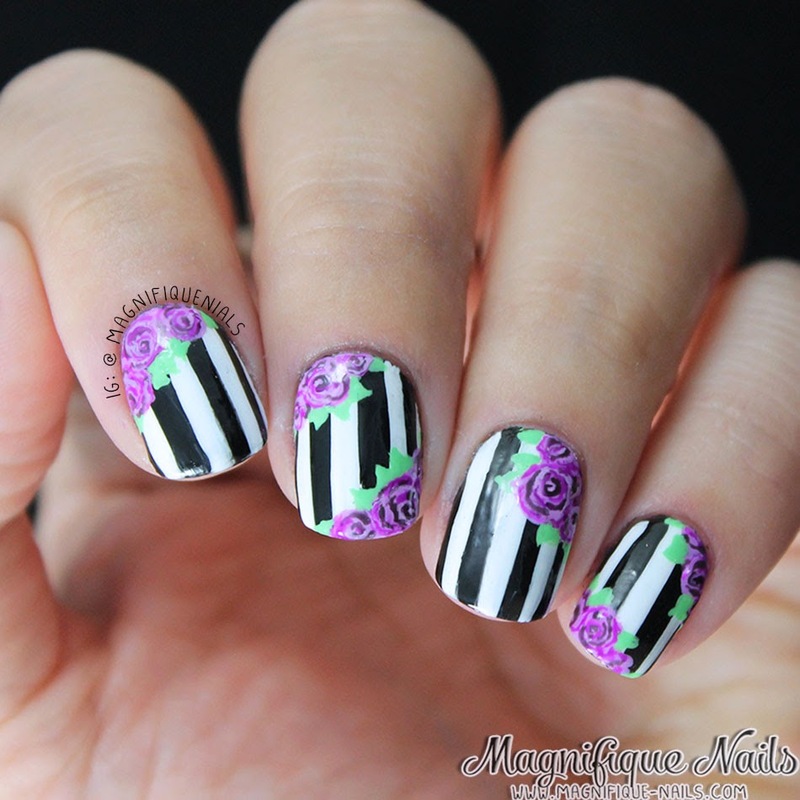 Purple Roses: So I really end up doing something floral, but I wanted to use my Revlon roses tutorial I did last year. I applied two coats of Revlon Nail Art Expressionist Night & Degas, and used their white stripping brush for the white lines. I added the florals using Revlon Nail Art Neon Ultra Violet mixed with the white. I highlighted the florals using the same Ultra Violet and Station Guillotine Grape.